OVERLAND PARK, Kansas - May 2, 2018 - Bushnell, an industry leader in high-performance sporting optics, has recognized Bryce Towsley with the 2018 Bill McRae Lifetime Achievement Award for his contributions to optics and the outdoor industry. The Bill McRae Lifetime Achievement Award was established by Bushnell to honor the legendary writer and photojournalist for the vast contributions he made to the optics and outdoor industry throughout his 50-year career. Introduced in 2011, the annual award was created to recognize McRae and the journalists who have made a profound impact in the industry. An active 3-gun and USPSA shooter, Towsley has hunted across the country and around the globe, and has been a consultant for companies throughout the shooting industry. 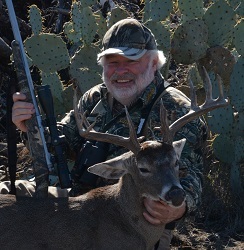 Towsley has published thousands of articles and photos in nearly every major outdoor and firearm outlet. He is a strong technical expert on firearms, gunsmithing, reloading, shooting, and, most importantly, optics. Bushnell, a Vista Outdoor brand, is one of the most recognizable and trusted names in quality optics. Its products have made it a global leader in hunting, shooting, outdoor sports, bird and wildlife watching, tactical and law enforcement, and general observation. For more information, visit www.bushnell.com.